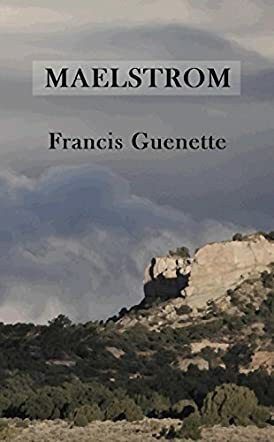 Maelstrom by Francis Guenette is about a series of events that started when a young woman dies of a gunshot wound. This one incident starts a series of events in which old rivalries are revealed, power plays are made, and things go downhill. When the older men are thinking about keeping their hold strong, the other old man is plotting his revenge and he is not afraid to use an innocent man who owes everything to him. In this small town, big things are happening and they are happening fast. Lives are turned upside down and there is no stopping them. This novel may seem a little complicated at first glance, but it is a highly interesting story that takes the form of a literal maelstrom. I must admit, I was taken by the author’s wit and the way she played with words. If you are reading this novel, you will know what I mean. The title of the novel fits perfectly with the story and plot line of events. It has drama, crisis, and even some devious little old men who need to be put in their places. Sometimes, you can feel the writer’s dedication to their work. Maelstrom was one such novel. Guenette is an extremely talented writer. Yes, the novel has a lot of characters, but that does not take the fun out of it. It may seem confusing in the beginning, but as the novel progresses, you will be able to enjoy it and keep everything in your mind. And this is because this novel is interesting. Seriously interesting. A great action packed drama that keeps you entertained.